The PARC Group, Nocatee’s master developer, has revealed plans for Twenty Mile Village, the newest neighborhood in its Twenty Mile community. Located just west of the Intracoastal Waterway in St. Johns County, Twenty Mile Village residents will live alongside huge oak canopies, preserved lands rich in history, rustic split-rail fences and old-Florida style accents. The new community will feature Twenty Mile Park- a new amenity center open to all Nocatee residents. It will include a shallow-entry family swimming pool with lap lanes, Waggin’ Tails dog park, playground, athletic fields, open-aired pavilion and an event lawn. Carved out of the natural environment, the tree-canopied park will remain home to native flora and fauna, and is expected to be completed by late 2015. The Twenty Mile amenity center will be funded and constructed by The PARC Group and donated to the Nocatee CDD. 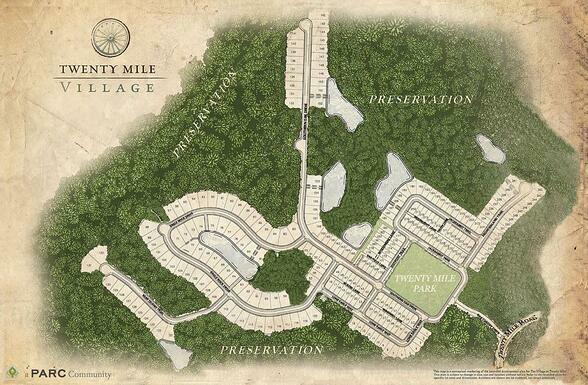 Twenty Mile Village will feature new home products with elevations that are unique to Nocatee. The builders will be David Weekley Homes, Mattamy Homes, Providence Homes and Standard Pacific Homes. Homes will start in the mid $200s. The new neighborhood will include two areas: Village Park, which features a variety of homesites for homes up to 2,900 square feet; and Village Grove, which has larger homesites for homes up to 3,700 square feet. All home sites in Village Park will be situated around Twenty Mile Park and most homes sites in Village Grove will back up to a preserve or lake. Two model parks will open this summer and builders will start pre-selling homes in March. To join the Twenty Mile Builders VIP List, click the "Twenty Mile at Nocatee" button above or click HERE. Twenty Mile Village will celebrate the area’s rich history with a display at the neighborhood’s entrance, visually detailing the events that happened on the land. To learn more about afforadable new homes at Nocatee, stop by the Nocatee Welcome Center or call 1-800-NOCATEE.